Soulful soul food. 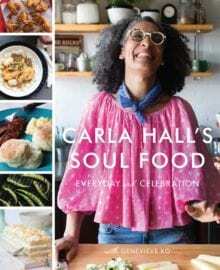 Invite Carla Hall into your kitchen with her celebration of soul food. She will cheer you on as you make her savory red pepper bread soup, black eyed pea hummus and crudités and brown sugar baked chicken. The pages are filled with Carla’s humor, wit, and 145 recipes that will feed your heart and soul. For a breakfast twist that will surely make everyone smile, a plate of green eggs and ham, is perfect soul food to begin the day.